This series of flower essence formulas was inspired by my personal life transitions and increasing awareness of myself as woman. 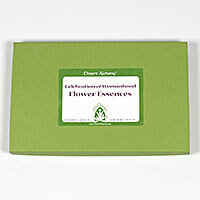 I have used them with my clients and had abundant feedback from other flower essence practitioners and self-help users. Each of these essences may be used for the specific issues or transitions indicated by the title of the formula as well as for harmonizing the “inner” aspects of womanhood. For instance, The Miracle of Menarche formula is an excellent assist for a young woman who is just beginning to menstruate. It can be used for as long as necessary to help the transition, whether it takes one month or a year. The formula is also applicable, for helping us (no matter how old) to go back and clear or resolve any like issues from the delicate time of our puberty. Flower essences are infusions of flowers in water. They are a safe way of receiving nature’s harmonizing qualities. By using them, we may find that limiting patterns of thinking or behaving begin to dissolve. We may experience a sense of greater ease and a lessening of stress in relation to situations in our lives. We formulated this together with a licensed midwife who had facilitated over 600 births. The formula focuses on surrendering to the primal energy of the birthing process. It facilitates harmonizing the emotional body to express feminine energies at their highest level. It is a wonderful support for “inner births” as well as childbirth. This formula helps us express passion appropriately. The Dragon Lady Formula is excellent for accessing the courage to express this essential emotion and for balancing its inappropriate or overblown expression. The Helpless Siren Formula inspires awareness of the ways in which we use manipulation or sexual implications to get our needs met. It strengthens our ability to know what our needs are so that we can choose appropriate ways to have them met. This formula is excellent for activating and deepening our inner sense of “mother”, the receptive and nurturing aspects of ourselves. It enhances feelings of caring and basic security. This is a formula to assist our awareness of how to make and honor healthy boundaries: to be able to interact with others without becoming enmeshed with their perceptions of who we are; to be able to give others the information necessary so that they will respect and honor us; and to facilitate removing walls of alienation. Menarche is the time of a woman’s first menstruation. This formula offers support for the flowering of a girl into womanhood: for accepting responsibility for our sexuality and sensuality and the recognition of a new relationship with the five senses. It can be used to for healing issues that went unresolved at puberty. This formula offers support to accept our feminine cycles. It was specifically formulated to help us remain in emotional balance as we experience hormonal fluctuations. This is for supporting a harmonious transition to motherhood, whether we have “given birth” to new parts of ourselves or given birth to a baby. It easily opens instinctual and intuitive senses to know our (inner or outer) child’s needs and how to nurture them. We learn surrender to universal energy as the source for all our functions. It helps us to softly but powerfully be the center. It supports inner peace and outer giving, nurturing and empathy. The Single Mother’s Formula offers excellent support for issues resulting from single mothering such as: overwhelm associated with trying to play too many different roles; feeling that there is never enough time or resources for healthy child rearing; guilty feelings of doing too much or not enough for our children. It helps us to move the focus to our needs so that we can then be available in the best way possible. This formula can enrich our lives with the naturally refreshing innocence that resides within us. It is excellent for developing gentle strength and consciousness of our deepest purity of intention. It can be used whenever we feel a need to control everything around us in order to find fulfillment. It is also helpful when we need to reactivate our capacity for creating magic in our lives. This formula helps us in accessing and releasing deep level psychic, physical, emotional and mental shock and trauma that blocks deep awareness of our own sexuality and body consciousness. It brings us in touch with our own purity and innocent sensual and sexual aliveness. It is an essence of choice for sexual abuse issues. The wild woman within each of us is a great benefit as long as she has the opportunity to express herself. If we continuously lock her up in a cage, she explodes and breaks free in ways that may not be in our best interests. Given the freedom to express herself, she is a force of pure and powerful energy that knows her own self-healing power.